The refurbished Panasonic Toughbook 31 is powered for today’s user. This refurbished Toughbook has the same great functionality as a new fully rugged laptop but it is now a fraction of the price! Featuring an Intel Core i5 2.4GHz processor this refurbished Toughbook is super fast, coupled with a brand new 128GB Solid State Drive and 8GB RAM your Toughbook 31 can boot up quickly. The Refurbished Toughbook 31 is MIL STD-810G ruggedized, from wind to rain, dust to salt water, bumps and bangs it can go where you go! These computers are in new or almost new appearance with no scratches or dents. 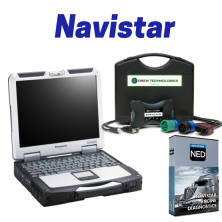 Navistar Engine Diagnostic software is the factory software for diagnostics and programming for Navistar® Engines. Navistar Engine Diagnostic software covers a wide range of diagnostic support for MaxxForce engines. Coverage includes all International MaxxForce (2007 & later) electronic engines. This software updates periodically, enabling you to have the latest coverage. As an added bonus we will supply the pre-2007 engine diagnostic software at no charge. We’ll also install the software remotely.